ANIMAL ARCHITECTURE | Jak to jest być nietoperzem? Jak to jest być nietoperzem? Animal Architecture is an online project broadly concerned with the role of ecology and biology in architecture. Przyznawana jest również The Animal Architecture Awards! …is a project about what it means as an animal to make and delineate space. …is a project about the fashion, obsession, and fetishism of nature. …is not a project about the homes, holes, caves, nests, hives, burrows, or tunnels that animals already architect. … is project born from the belief that the history of Architecture is a humanist history and guilty of relegating all other species of life to the status of second-class beings. What makes us so special anyway? 1) What is an Animal? As Derrida would claim “Human” is merely the name that a particular section of the animal population has give itself the right to give itself. In a similar vein, “Animal” is the term we give to anything that is not us, human that is. Therefore this website will never take “Animal” literally or at face value; and more often than not, will interpret it in its broadest sense that is anything non-human. So when we talk about Animal we’re talking about everything from squirrels, and cats, to mitochondria, bacteria, and ecosystems in general. Just as “animal” has been broadened so will “Architecture.” With Architecture we’re getting at more than just the brick-and-mortar version of human production and thinking more about systems of organization. – and follows simple structural logic ie. Material at hand, + force of gravity + method of construction = form. We can see this in conk shells, oyster reefs, termite hills, and yes, beaver dams. Will cross the human/animal divide by demonstrating, discussing, and exploring the intersection — the at times literal edge between humans and everything else around them. Architecture, as our historical defense against outside forces will be the fulcrum to open this debate. What happens when we no longer view ourselves to be separate from the world around us? Keep checking back to see what we find out. 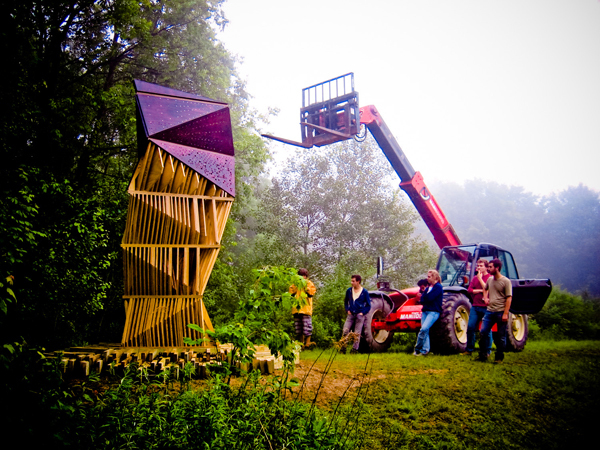 Animal Architecture is a online project curated by Ned Dodington. Ned (resume available here) has a Masters Degree in Architecture from Rice University, Houston TX, an Art History Degree from Carleton College and a particular and obvious interest in ecologically aware architecture. Comments can be directed to his attention at (animalarchitecture at gmail.com) He appreciates links, stories, projects and helpful tips.